Maalai brings visibility to the trauma and untold stories of South Asian women through past and present. On July 21, Lakshmi Ramgopal’s sound installation, Maalai, will be displayed at Chicago’s DIY pop-up-show, Remembry. 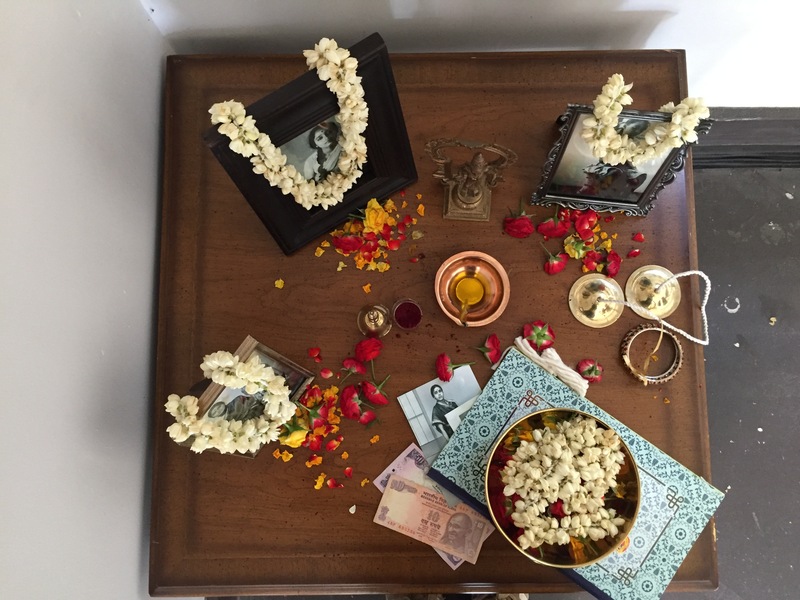 The installation uses Tamil and English recordings of women in Ramgopal’s family, written and photographic materials, and Hindu iconography to explore diaspora, colonialism, and intergenerational trauma. The installation premiered at Chicago’s Comfort Station last month. “—which is completely sacrilegious. My mom would kill me if she knew I had done that,” Ramgopal said. It is a testament to Ramgopal’s relationships to her ancestry and upbringing. Framed portraits of Shiva, Parvati, and Shirdi Sai Baba are representative of deities that were important to different members of Ramgopal’s family. Images of women in her family represent personal “god-like figures” in Ramgopal’s life. From the Maalai installation. Photo courtesy Lakshmi Ramgopal. “This is my personal pantheon. Especially in Indian society, we regard our elders as sources of guidance,” she said. Ramgopal’s grandmother passed away last month, an event that was the driving force behind Maalai. Ramgopal is interested in how Hindu women use prayer to connect to the people they’ve lost. For many Hindu women, prayer is a form of self-soothing. Ramgopal remembers her grandmother spending hours inside the altar praying for the family. “That was her way of making our lives better because she was dealing with the Gods in an intangible, sacred way whereas my mom worked difficult jobs she didn’t want. And that was her way of sustaining and supporting us,” Ramgopal said. Maalai examines the role that Hindu spirituality plays in how Indian women construct identity and deal with trauma. In South Asian immigrant communities, intergenerational trauma is a common and binding narrative. First, Ramgopal explained, there is the trauma of families being split up. Because of British colonialism, from which India continues to suffer aftermath, people started migrating in the wake of the 1965 Immigration Act, created because the U.S. needed brain power in STEM fields. “There weren’t many reasons to stay in India after that. And that was hard on families. It continues to be,” said Ramgopal. It was hard on Ramgopal’s mother, who was close to her mother and great-grandmother. The heartbreak that Ramgopal’s mother went through influenced the way she raised Ramgopal and her brother. “There is this demand to be close by. My mom was really upset when I left for college because I went far away from the home I grew up in, just outside of Boston…that was weird for my mom. She’s never been able to understand that— why a daughter would want to leave home,” said Ramgopal. She describes her mother’s constant sense of displacement. As Ramgopal’s grandmother aged, her mother often wanted to go back to India and again faced a trauma precipitated by distance. Ramgopal’s grandmother became sick while her mother was still in the U.S. When Ramgopal’s mother finally did get to India, her grandmother was in a coma. Ramgopal waxes more collective traumas. The lack of community membership when your community is defined as family, not the people in a building or neighbors. Abuse. Poverty. War. “The Indian diaspora is here because [people were] leaving something behind something that was bad, in addition to leaving behind their families. Subsequent generations confront that trauma in ways that are complicated. We didn’t experience the trauma firsthand but we are impacted by it because of the way our parents choose to raise us in response to what they’ve gone through,” she said. The installation asks how South Indian women in pre- and post-1947 India preserve their personal histories and when they choose to self-erase. For the sound component, Ramgopal uses about 20 minutes of recorded material she has pieced together from interviews that she and her mother conducted with Ramgopal’s grandmother. Ramgopal began the interviews in 2013, when she realized she didn’t know a lot about her grandmother’s life. Ramgopal’s grandmother came of age when India became independent from the British Empire. 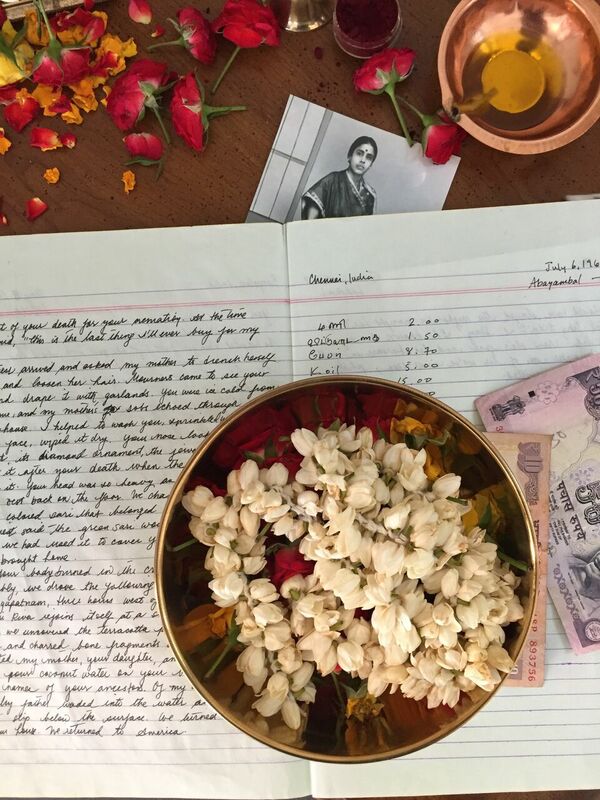 For Ramgopal, understanding her grandmother had important historical and personal value. “In her generation and even in my mom’s generation, a lot of South Asian women don’t talk about their lives. They’re very self-effacing. Immigrant families can be like labyrinths…there’s a lot of family secrets and there’s a lot of erasure that goes on, especially issues surrounding mental health,” said Ramgopal. At the time Ramgopal was conducting the interviews, there was no idea for an installation. When her grandmother died, she was grateful she had the recordings. Ramgopal’s grandmother moved to the United States when Ramgopal and her brother were babies. She helped raise Ramgopal and was present into her life as a young adult. Eventually, Ramgopal’s grandmother moved back to India. Every other year, Ramgopal and her mother would visit Ramgopal’s grandmother. When she died, there was a sudden shift in the family history. 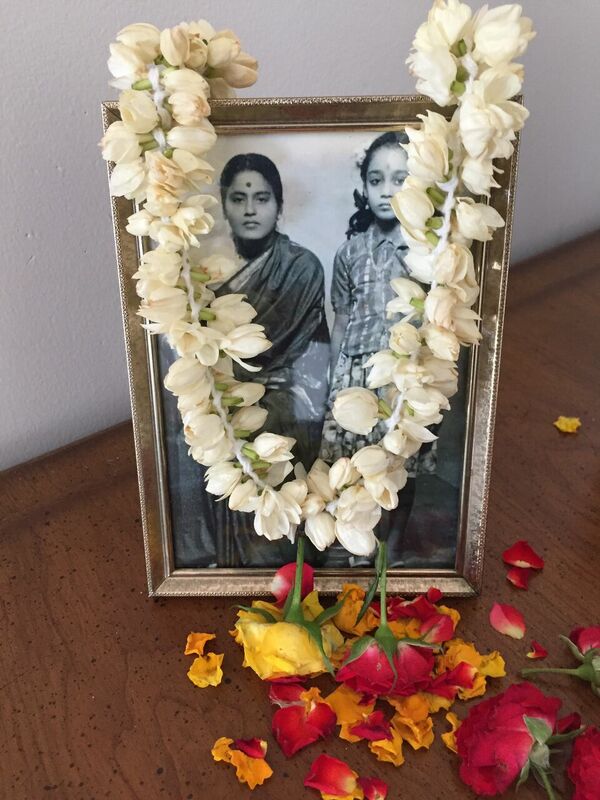 Ramgopal didn’t think there were any photos of her grandmother until after she died, when she found a couple photos in a photo album her grandmother had kept locked in a bureau in her bedroom in India. “My grandmother didn’t keep any kind of diaries. Her life was pretty tough. It was so challenging for her that she tore up photos of herself when she was younger,” said Ramgopal. Even before she passed away, Ramgopal was thinking a lot about how South Asian women think about identity, who they are in relation to their families, and the extent to which they allow themselves to self-differentiate from their families. “I think a lot of South Asian women struggle to be autonomous people while also maintaining the emotional intimacy and closeness we are expected to have with our families,” said Ramgopal. “Maalai” is a Tamil word for “garland.” On the last day of the installation’s run at Chicago’s Comfort Station, Ramgopal closed with a short improvised performance incorporating the Sanskrit, Tamil, and Hindi hymns and lullabies sung by her grandmother in the installation’s recordings. “I conducted a kind of puja at the altar with some Jasmine garlands. I was interested in playing with this idea of a garland made of different flowers and multiple objects—creating a garland of pieces of knowledge, which is essentially what you do when you’re part of a diaspora, you’re putting together these random things that you know and inherit and learn,” said Ramgopal. Ramgopal is also an electronic musician who goes by Lykanthea. Lykanthea released her first record in 2014, and this installation has ended up being the launch pad for the next one. She started recording it the same afternoon we spoke. Lakshmi Ramgopal as Lykanthea. Photo courtesy Lakshmi Ramgopal. Ramgopal has a feeling she will be examining the ideas behind Maalai for a long time. “[A lot] of things I’ve wanted have been divergent from the path of a ‘good Indian girl,’ because I often strain my relationships with my family. Now, in my early thirties, I am ready to unpack my childhood and my relationships with my parents and especially with my mom—those are so fraught for Indian-American women,” she said. You can follow Ramgopal on Facebook, Twitter, Instagram, Tumblr, Bandcamp, and her website. Read more about Maalai and where it will be appear here.